On the coast of Suffolk, a young archaeologist is haunted and hunted by the guardian of an ancient treasure. A Warning to the Curious is arguably M R James’s last great ghost story. Published in 1925, it draws on the author’s own experience of holidaying in Aldeburgh, and seems at the same to time to be a response to the traumas of the first World War. Robert Lloyd Parry here performs the story in a single take, by the light of a single candle, and in an accompanying documentary looks at the cultural and historical influences on the tale. “Dim Presences.” A 1hr documentary looking at the cultural and historical influences behind James’s materpiece. A windswept golfing holiday on the Suffolk coast takes on a nightmarish shape when Professor Parkins blows on a long buried whistle. Oh, Whistle, and I’ll Come to You, My Lad is considered by many to be M R James’s masterpiece. Probably first read to the author’s friends in Cambridge at Christmas 1903, it has now been brought back to thrilling life in this new collaboration between Nunkie and ThomThom Productions. Filmed in one take by the light of a single candle at Hemingford Grey Manor, this is supernatural storytelling at its most stark and effective. It is accompanied here by a new documentary, “Wits in Felixstowe,” which looks at some of the people and locations that might have inspired the tale. This was made possible with the generous support of many patrons. “Wits in Felixstowe.” A 40 minute documentary. Meet Mr Karswell, ‘The Abbot of Lufford’ – magic lanternist, historian of the occult, and scourge of the academic establishment. Casting the Runes is one of M R James most admired tales. Now it has been brought to thrilling life in this new collaboration between Nunkie and ThomThom Films. Filmed in one take by the light of a single candle, this is storytelling at its most stark and effective. 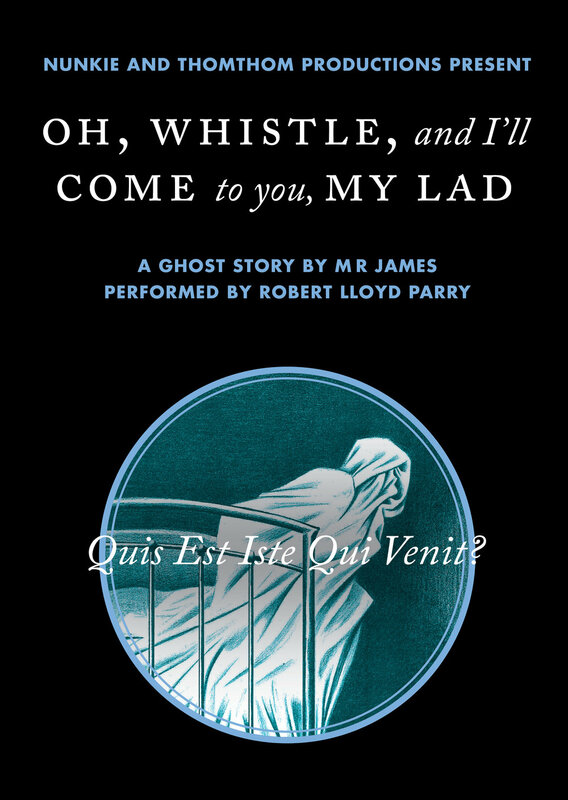 An introduction to, and rehearsed reading by Robert Lloyd Parry, of A Vignette, M R James's final, posthumously published piece of supernatural writing. Robert Lloyd Parry reads two little known supernatural tales by Lucy M Boston [1892 – 1990], the author most famous for her acclaimed series of Green Knowe children's novels. The Tiger-Skin Rug is a mysterious tale, describing what happens when the spirit of the jungle visits a quiet English village . . . In Curfew the tolling of a long-silent bell awakens a shocking, ancient evil. It has been hailed as one of the most chilling tales in the M R James tradition. Please email roblloydparry@hotmail.com to reserve your copy. James asked this question at the end of the last ghost story he ever wrote – A Vignette, published in a London newspaper, five months after his death. This is one of nine shorter works included on this pleasingly terrifying new audio CD, two of which have never been recorded before. Available digitally from iTunes and Amazon.